For many Americans, turquoise seems to be a distinctively American gemstone. It is mined in Arizona, New Mexico, Colorado and Nevada, with a long history in native American jewelry. Yet turquoise has been an important gemstone in many Eastern cultures for thousands of years. This is reflected in the English name for the gem, since it was first brought to Europe by traders via Asia Minor. The turquoise probably came from famous turquoise mines in Iran or Egypt before reaching Turkey. Turquoise, along with lapis lazuli, is one of the oldest gemstone materials known to man. The color of turquoise is so unique that this has become the standard word we use to describe the slightly greenish shade of cyan and similar colors. The legendary home of the world's finest turquoise is Nishapur in Iran. Turquoise became a major trade and barter item for the early Persians. Persian turquoise was found in ancient graves in Turkistan and in graves throughout the Caucasus in the 1st to 3rd century A.D.
For centuries, the most valuable turquoise came from Iran but today deposits are also found in Afghanistan, Argentina, Australia, Brazil, China, Israel, Egypt, Mexico and Tanzania. 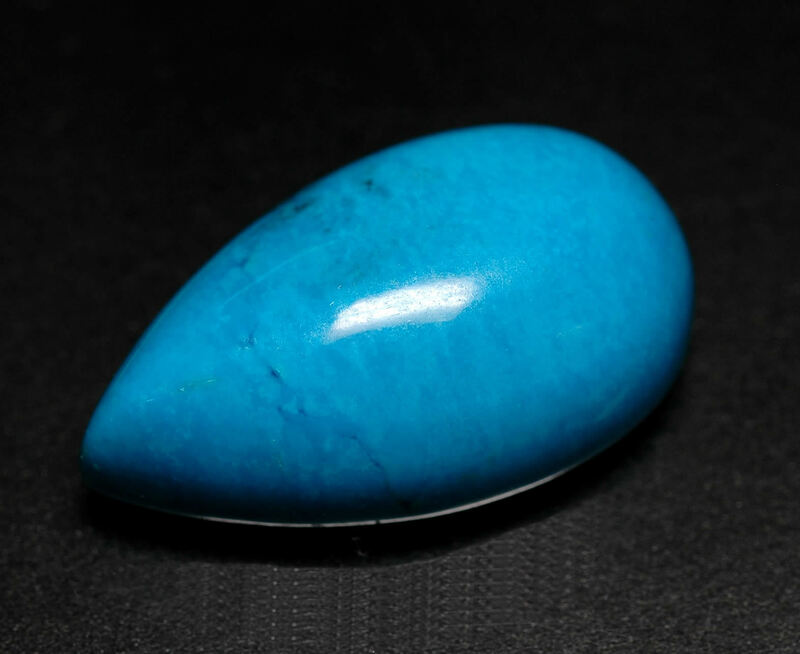 The name "Persian turquoise" is now generally used to refer to any turquoise stone that does not have the black or brown veining commonly found in turquoise mined in the United States and used in a style of jewelry created by the American Indians. Turquoise is composed of hydrous phosphate of copper. It is fairly soft, with the hardest specimens reaching only 6 on the Mohs scale. Despite its softness, turquoise takes a very good polish. Turquoise is always opaque and the color varies from blue to green, sometimes with flecks of pyrite or interspersed with dark, spidery limonite veining. Like many gemstones, the demand for high quality turquoise exceeds the supply. This has led to the development of treatment methods to improve the color and durability of lower cost material. Softer and more porous turquoise can be enhanced by impregnating the stone with hot acrylic resin. The resin improves the color, hardness and durability of the material. As long as the materials are openly declared to be treated, this is regarded as an acceptable practice in the gemstone industry. Color preferences for turquoise vary by region. It has long been thought that a stronger blue with less green is more valuable, though in Tibet a greener blue is preferred. Turquoise displaying a spiderweb pattern, from the matrix (host rock) from which the turquoise came, is valued in the USA whereas in the Middle East, clear vein-free material is preferred.